Ready your lance and charge into battle as a valiant cavalier! Want to add interesting characters to your campaigns but don’t have time to create them? Need new characters at the last minute for you or your players to use during a game session? Wish you had a premade character at the ready to help introduce a new player to RPGs? Characters-By-Level has you covered! 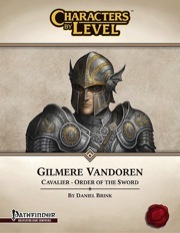 Characters-By-Level (CBL) is a time-saving RPG accessory that offers GMs and players ready-to-play pregenerated characters to be used in games of any level. Each release provides you with stat blocks for one or more characters at multiple levels for a particular RPG system along with profiles detailing their character builds, backgrounds, physical descriptions, and personality traits plus ways to help you fit them into your games. You will also receive high-quality digital character artwork suitable for character sheets, virtual tabletop tokens, visual aids, and desktop wallpapers. CBL characters are designed to be inserted into your games with a minimum of fuss and additional customization. GMs can deploy them as ready-made NPCs to use as either allies or rivals. Players can use them any time they need a character to play on short notice. Playing a CBL character requires little to no preparation, letting you spend more time playing your game and having fun instead of preparing for it. Less work, more play! For the Pathfinder Roleplaying Game, CBL characters come with complete NPC and PC stat blocks for levels 1-20. NPC stat blocks are based on the 15-point-buy method or the default NPC heroic ability scores. PC stat blocks use 20-point builds with two starting traits. All race, class, skill, feat, equipment, spell, and trait choices are selected from the Pathfinder Roleplaying Game Core Rulebook and Pathfinder Roleplaying Game’s Advanced, Bestiary, and Ultimate sourcebook series. Let Gilmere Vandoren, a gallant cavalier pledged to the Order of the Sword, and his loyal steed Zeb be part of your campaign today! * - With the exception of our virtual tabletop tokens and website avatars, all Characters-By-Level digital files are for offline personal use only. This first installment of Rabid Hamster Workshop's Character-by-Level-series clocks in at 50 pages - 1 page front cover, 1 list patreon-thanks, 1 page editorial, 1 page ToC, 1 page SRD, 1 page back cover, leaving us with 46 pages of content, so let's take a look! What do we get here - well, simple - a character, presented for each level from 1 - 20. But there are two suites of statblocks here - one for PCs and one for NPCs. NPC builds are based on 15 point buy or the NPC-heroic array, while PC-builds utilize the 20-point buy array plus 2 traits. A nice list of WBL for the builds is provided for each level. It should be noted that PC suggested WBLs have been lowered for characters in this series, allowing for GMs to add items/ utilize the characters in campaigns with less pronounced amounts of wealth/magic. Conversely, somewhat to my chagrin, mundane low cost equipment does not feature within the respective statblocks, which means you ultimately have to still look up those crucial pieces of mundane equipment, constituting a minor comfort detriment. Gilmere, the character featured herein, has chosen the order of the sword and the emissary archetype and comes with a short background story as well as the beautiful high-res mugshot. Roleplaying advice, physical description, height and weight - all provided, including general explanations of the build. Gilmere focuses both on solid mounted combat and combat on foot, with the latter following the solid Power Attack/Overrun-based feat-tree. As a cavalier, he obviously also has a warhorse, Zeb, who is provided in the respective iterations for each of the statblocks. Now conveniently, the pdf does not simply smash all the statblocks back to back into your face, but rather lists the progressions of feats chosen at the respective levels as well as the magic items gained and when they show up in the respective builds covered in an immensely handy list, while also providing an array of magic item suggestions for GM and players to ponder. Thereafter, we dive into the respective statblocks, which manage to cram all stats for the character in question as well as for the companion horse on one page, meaning you can simply print out the page you require. Beyond the massive array of statblocks, the pdf comes with an archive that contains beyond high-res version of the respective mugshot also HeroLab-Portfolios and Portraits, Virtual Tabletop Tokens and Visual Aid/Wallpaper-versions of the graphics as well as the information required for licensing the material. Editing and formatting are very good, crisp, clean and concise. Layout adheres to a 2-column full-color standard and the pdf comes fully bookmarked with nested bookmarks for your convenience. The original artwork is a high-quality piece and the supplemental material and guidance provided are nice. Dan Brink's first CBL is a nice file that can take a lot of pressure off a GM or player; the cavalier presented is passable in his efficiency and should fit into most gaming groups. Optimization-wise, there is some room, but this way, he is useable in more contexts. The supplemental information presented makes navigating this file easy and the overall, rewarding. However, there are some nitpicks I can field: Personally, I'd strongly suggest to provide a "Budget"-line for GMs that lists the discrepancy between GP used in the build and that suggested by WBL for each build to make shopping sprees to fill in the blanks quicker - yes, the number is just one quick calculation away, but still. Secondly, the build itself, while at least archetyp'd, is simply not that complex or interesting - Gilmere is pretty much an quite efficient vanilla cavalier. If that's what you're looking for: Great. At the same time, the difficulty of creating this one isn't that high, meaning that conversely, the time saved, while still significant, is somewhat less impressive than for different, more complex builds. But there is one more factor, and that one is very much in favor of this pdf: It's ridiculously inexpensive for the work it takes to make a lvl 1 - 20-progression, much less two of them. Ultimately, these factors all conspire to make me consider this a good pdf, but not a perfect one. My final verdict will clock in at 4.5 stars, rounded down to 4 for the purpose of this platform. Now available—and welcome Rabid Hamster Games!